New service allows downlink speeds up to 20Mbps, five times the previous maximum, using a smaller antenna. Higher performance is gained at a much lower cost, which allows up to four times higher connection speed at the same cost, if compared to previous Ku-band service, without compromising connection reliability and stability. 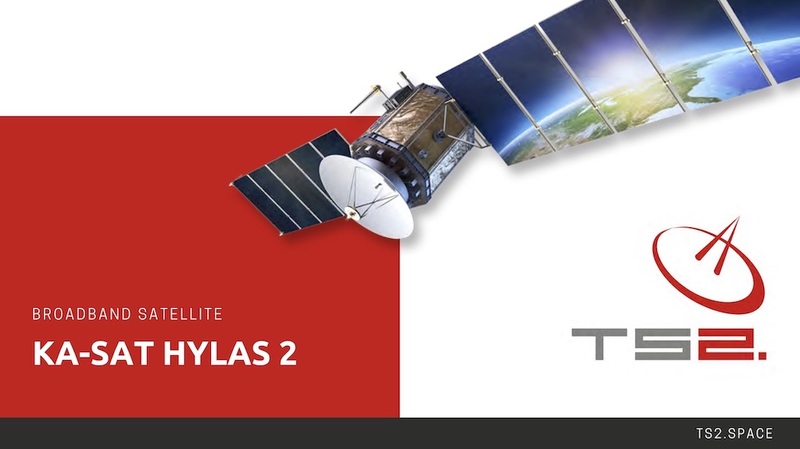 The HYLAS 2 satellite carries 24 active Ka-band user beams and six gateway beams. The Ka-band spot beams are providing two-way communications services to facilitate high-speed delivery of data to end-user applications such as corporate networking, broadband Internet access, business continuity services and video distribution. New Ka-band service is based on the same, field-tested and proven technology provided by iDirect. Ka-band service requires a smaller antenna, reducing the equipment and transportation costs and making the installation easier. Hylas-2 has three times the capacity of Hylas-1 and some 40 separate beams, each covering a different fixed area, plus one steerable beam which can be directed anywhere. Up to twenty-five beams can be active at any one time. The extra beams give some flexibility in the areas that TS2 can serve.